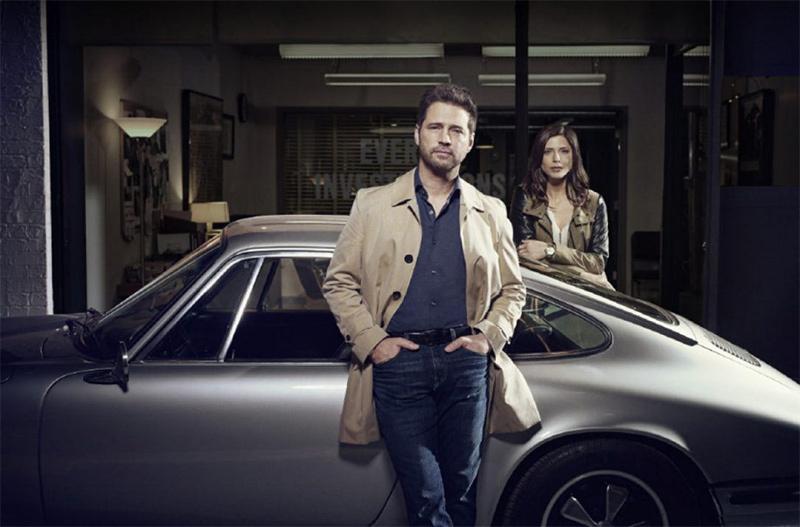 Jason Priestley returned home from Hollywood to Canada and made the multi-award winning comedy Call Me Fitz. He says he had so much fun making it, he stayed, and this season, Priestly launches two new series, a brainy family sitcom Raising Expectations and the detective comedy drama Private Eyes which he also executive produces. He stars as “retired” hockey legend Matt Shade who’s looking for his second act alongside Cindy Sampson as Angie Everett, a tough talking but beautiful private eye who sees potential in him for nosing around for fun and profit. Their cases are pretty interesting as is their fiery relationship. We spoke with Jason and Cindy in Toronto. AB – Something I really like about this series is that it’s about people trying to better their lives by developing new skills, new ways of coping with a second act. JP – Those are the themes of the show and those are the themes that we want to explore. It’s really about second chances and about redemption, about taking chances and about growing and those are all things that a lot of people are very afraid of. People are afraid of change and we’re trying to show characters that are embracing change and want to change, like Matt wants to become a better person for his daughter and show her a better life. CS – Changing, evolving, growing, and being open to that stuff. Matt Shade, trying to be a better man is inspiring. I think that’s one of the things, just like the humanity at the base of it all. So it might be a back and forth between Angie and Shade, but she definitely sees that. You’ve got to respect that. AB – Your chemistry sizzles, laced with sarcasm and some high powered put downs. Its funny but its almost adversarial. And you’re equals, but I just wonder if at any point there’s going to be a power struggle, a funny one. JP – Yes. I’m sure that there will be — yes. CS -Yes, the more comfortable you feel. AB -Okay, Jason, a hockey champ turning detective? JP – Well, Gare Joyce thought it originally because this show and we developed it from a series of books he wrote. He’s actually a sports writer here in Toronto. The first books are called the Brad Shade mysteries, there are three of them. AB – How did you connect with Shade? JP – Well, I read the books and I liked the whole world that Shade lived in. I like characters that struggle and that have obstacles in front of them. Shade’s whole thing of a guy who’s looking for what his second act is going to be and a guy who’s struggling with being a single parent and struggling with what his new relationship with his father is going to be, with their unequal footing now that no longer in so much of a parent-child relationship in that new world that you live in when you’re both adults. What does that look like? He’s a guy who obviously has a bunch of new challenges in his life and characters that are struggling and have challenges I think are the most interesting characters to play as an actor. So I definitely related to Shade and he seemed like an interesting character to explore for me. AB – Cindy how about you? CS – I just saw the sarcasm, the wit, the humor. I really did. It bounced off the page for me and I was like, this looks fun and I want to do this. Sidebar, I also job shadowed with a police officer when I was in high school. I’m not even joking. Well, Grade 9, junior high. I wanted to be a detective. I’m not even kidding. So ironically now, look, I play one on TV and it’s a hell of a lot safer, isn’t it? I mean I get up pretty early in the morning, but yeah. So it was all of those things combined, like how much fun is that, plus all these little sub characters going undercover, wigs, dressing up. It doesn’t get any better. It just had everything I could possibly want to do. AB – I love that the show is shot in Toronto as Toronto. You show us things even natives don’t see, like private life on Ward’s Island. CS – For us also. There was a moment when we’re sitting out in the island and then it was dark, and we’re looking back at the skyline of Toronto and I was like, oh my gosh. It was really eye-opening for us, just the perspective to be like, wow, this is amazing. And what a little community they have going on out there. JP – It’s so cool out there. Remember that night we thought we got people thinking its fake, it looks too beautiful. CS – It was so beautiful and it looked like a set and all those houses were there and there is just so much character. AB – Speaking of character, you have some amazing supporting talent like Nicholas Campbell, Doug Gilmour and Barry Flatman. CS – And also Ennis Esmer, Cle Bennett, and Jordyn Negri. And Kardinal Offishall. We explore the whole hip-hop scene here in Toronto. We took the opportunity to shoot Toronto for Toronto and celebrate Toronto and all the exciting things that happen here in Toronto and use Toronto as a character in our show. CS – Then we explore speed dating after that. CS – Then we did identity theft. Oh my gosh, that was fun, really fun. AB – Okay. So here’s another idea for you, you tour Canada, you go to Northwest Territories, you go to Vancouver, you go to Fort McMurray, Prince Edward Island. I can’t get enough of Toronto, but I want the rest of Canada to become personally involved. CS – I feel like a lot of us feel that way. We’re like, no, there’s so much greatness here. People don’t know. And there’s that sense, there’s that feeling collectively where we’re like, we must show them, because it’s true. He’s from West Coast; I’m from the East Coast. Canada is fantastic and there are so many great things we can tap into here, good show ideas. We should do an episode at the Toronto International Film Festival and an episode with one of our teams, like the Raptors, the Jays or the Leafs or something. You know what, that’s the other thing, having the guest stars come in and see what a pool and like a wealth we have of talent here in this city. AB – Any romance on the horizon? CS – You want us to be together? I see where you’re going with this. AB – Well, it can take time, like Moonlighting. JP – Oh, it’s going to take time. CS – It’s a slow burn, slow burn. JP – If it ever happens, who knows? CS – Who knows? We don’t know. Did you catch the first episode? What did you think? Leave a comment.